Every year at the Green Market I make it a goal to bring home at least one thing that I am either unfamiliar with or have never used before. That has become more of a challenge every year, as the list of items with which I am unfamiliar is shrinking thanks to this very project. But so far I have been able to find something. 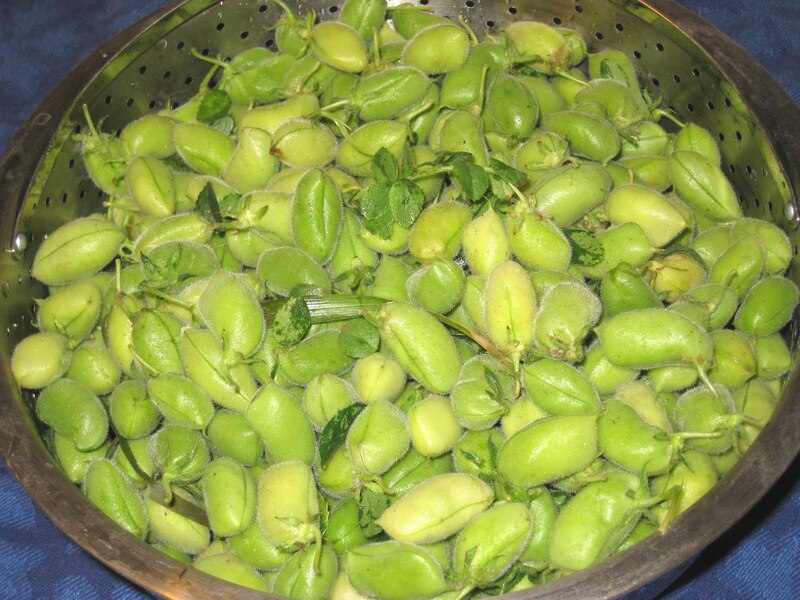 This year was no exception, thanks to Nichols Farms, who decided to start growing garbanzo beans. 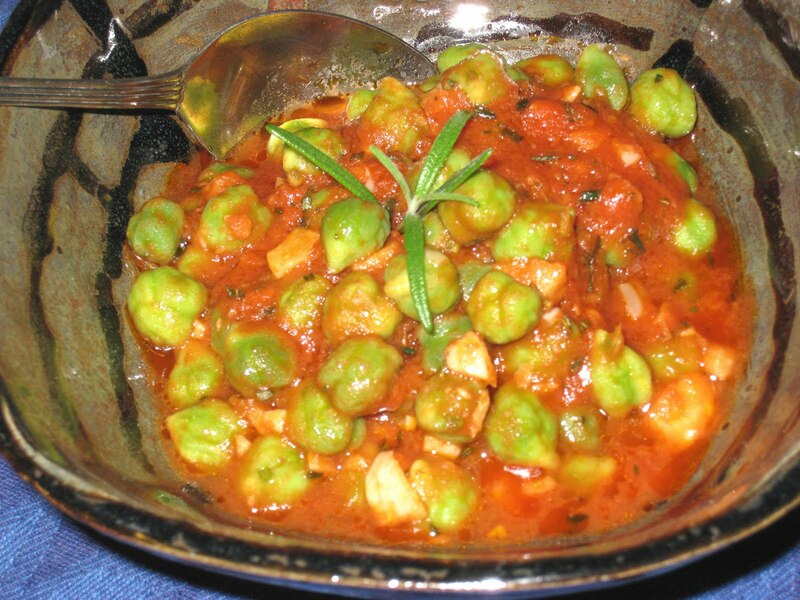 Garbanzo is the Spanish name for what many people call chickpeas. 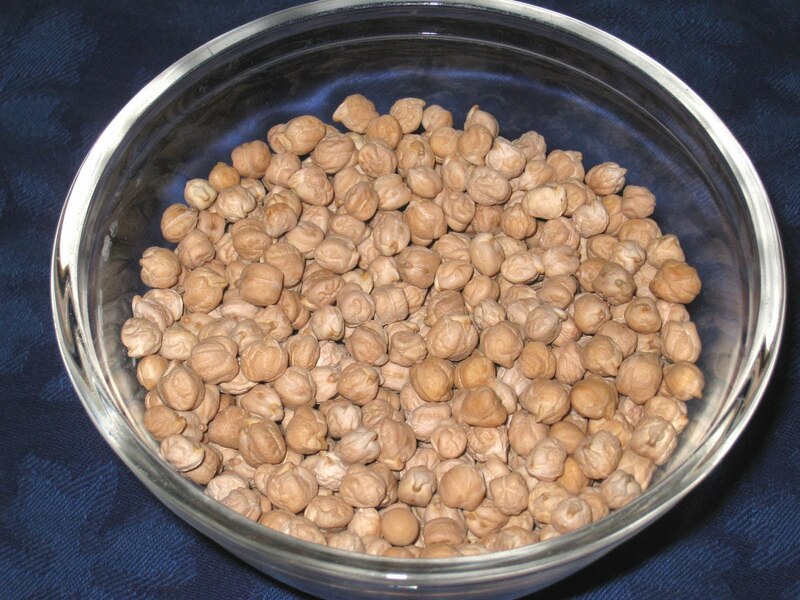 Growing up in Texas, I knew them as garbanzo beans and thought they were one of the most disgusting foods around. That is probably because I only ever saw them in salad bars, mostly in health food stores. I never saw anyone ever take any, not once. My first taste of hummus helped change my mind. I still didn't like the beans themselves, but I loved hummus. And when I found out that falafel was made with chickpeas I was even more of a convert and even bought some so I could make it. And once I discovered how easy it is to make hummus, I always had them around. But I still did not care for the beans themselves. They were so big and mealy to me that I couldn't imagine ever wanting to eat them just for themselves. But somewhere along the way that changed too, and now I love their solid nutty goodness and have been known to eat them in all kinds of soups, stews, and even all by themselves. So when I saw these green little pods at the market this week, I was curious. One thing that makes them stand out from other beans I have seen is that there is usually only one bean per pod, sometimes two. Just looking at them, I would never have known what they were. But once I held one in my hand, there was no mistaking them. I peeled off the thick skin (that dries into thin shell that surrounds the dried versions) and popped one into my mouth. It was sweet and fresh, and while it did not taste like a chickpea, it was delicious. 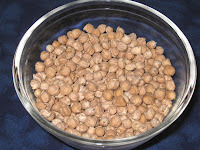 I thought I would post this picture of some dried chickpeas for comparison. They are as hard as wood and need to be soaked overnight before they are ready to be cooked. And even then, they seem to take forever to get tender. They taste so much better to me than the canned beans, though, that I do take the trouble to cook them myself. After I got the fresh pods home I got to work shucking them because I knew it would take some time to work through all of those pods. I bought about one-and-a-third pounds, thinking that would be enough to give me about a pound of the beans. 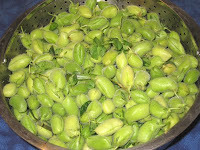 But I quickly discovered that some of the pods, the darker ones, didn't have any beans in them. There weren't too many, but there were enough that I noticed. All told, by the time I had them shucked I was left with about two-thirds of a pound. Which, at 3 cups, was no small amount. 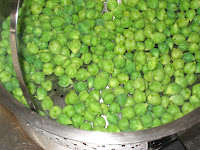 It wasn't until after I had shelled them that I did a little online reading, and one site said to boil the pods for a minute or two, then peel them. I do not know if that was necessary - I just boiled the shelled beans for about 2 minutes. They were a pale green when I first took them out of the pods, and you could clearly see the skins around them, much like the skin on a fava bean. I considered peeling them but decided to boil them first, and the boiling must have tightened up the skins because they are still there but you can't really see them. But you can see what a beautiful bright green they are, nothing like their usual drab, tan color. It was a little weird because they feel like chickpeas, and they have a similar texture, but they don't taste the same as the dried. 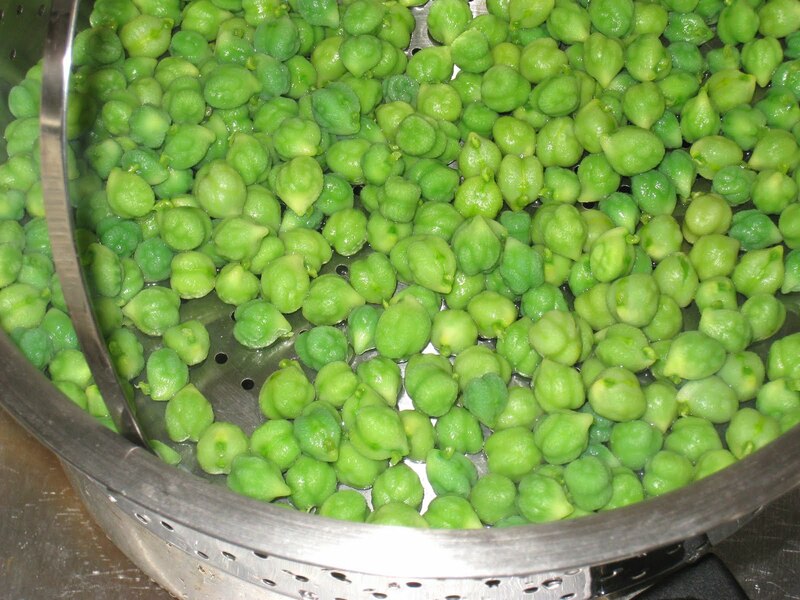 They taste faintly of regular peas, but just barely. They mostly taste fresh. That's the best way I can think of to describe them. The guy at the market said they had been making a lot of hummus with them, but it made more sense to me to do something that would leave them as unchanged as possible, so I decided to do something that would leave them whole. I have quite a bit of fresh rosemary growing in a pot on the windowsill, and I have a lovely recipe for chickpeas simmered with rosemary and tomatoes that I had grown tired of and taken out of rotation a few years ago. It seemed like a good idea. 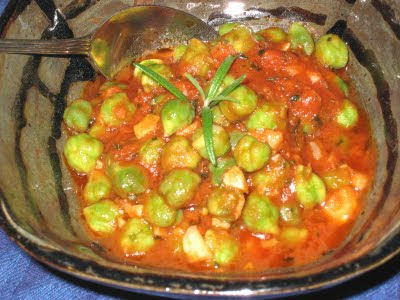 And it was a lovely idea, along the lines of of an Italian succotash. The garlic, rosemary and tomato were the perfect foil for the beans, flavoring them but not taking over. But oddly enough, I think I prefer the dried version. Maybe it's because I am more used to them. I was sure I had posted this recipe before, but I just looked for it and I'm not finding it. Maybe I took it out of rotation before I started this blog. If that is the case, I am doubly glad that I decided to make it. It's just as delicious with dried chickpeas. Heat the oil over medium heat in a three-quart saucepan. Add the garlic and saute until it is lightly covered, about 1 minute. Stir in the rosemary and the red pepper flakes and cook for 30 seconds more. Add the tomatoes and salt and pepper to taste and simmer just until the sauce thickens a bit, approximately 5 minutes. Stir in the chickpeas and parsley and simmer just until the flavors have blended, about 10 minutes.